Ladders for Leaders is a New York City initiative by the Office of the Mayor that aims to tackle NYC's youth employment crisis while training what they hope will be the most diverse tech workforce. Kimberley Dao is 19 years old and heading into her second year at Yale, but right now, she’s answering my call from Korea. She’s there participating in a language program at Seoul National University and says she’s enjoying immersing herself in the culture and testing out her Korean language skills. Dao is just one of many New York students who have enrolled in Ladders for Leaders, a New York City initiative launched in 2006 run by the Department of Youth and Community Development and supported by the Center for Youth Employment. The program brings businesses and New York’s youth together for paid summer internships across the city's major industries, including tech. Ladders for Leaders seeks students aged 16-22 from the New York City public high schools and colleges across all five boroughs, with the goal of making NYC's tech sector the most diverse in the country. This is just one piece of Mayor Bill de Blasio’s plan to attract additional tech companies and bring thousands of new jobs to the city. The Mayor’s Office is well aware of the current tech talent shortage and the hole that could be created if they don’t plan to help fill those jobs that they want to bring to New York. “As we make investments in this industry we know we need to provide a workforce for this industry,” says Gabrielle Fialkoff, senior advisor to the Mayor of New York City and director of the Office of Strategic Partnerships, and this is where Ladders for Leaders comes into play. 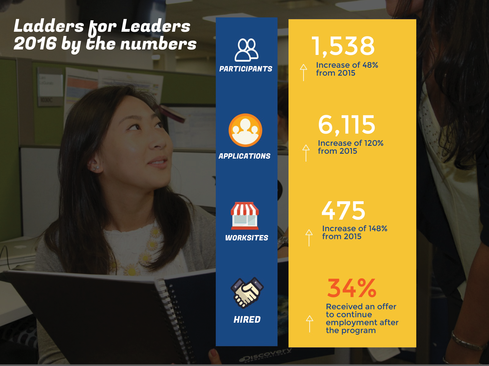 The Ladders for Leaders program has seen incremental growth and increased interest every year. Last year they placed 1,538 high school and college students in paid internships, up 48% from the year before, at 475 sites, and they're projecting to place 1,600 interns this summer -- more than triple the number from when the program began -- with 600 registered employers for another projected record breaking year. To date, about a third of Ladders for Leaders participants have been offered jobs at the companies where they have interned. The city began to scale the program by industry two years ago. The de Blasio administration launched the Mayor's Office of Technology and Innovation (MOTI) to help recruit more private sector tech companies to the Ladders for Leaders program. MOTI is on target to deliver 100 paid technology internships this summer, says Fialkoff. Of the growing industries in New York, the tech sector has seen as having the most prominent growth. Tech jobs increased 50% from 2007 to 2014. 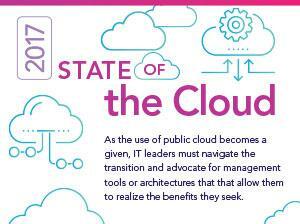 However, less than 5% of public school students are getting exposure to computer science education, says Fialkoff, and Ladders for Leaders is among the initiatives to help right the tech skills gap. “We believe that we must offer experience and exposure, exposure to careers and growing sectors in New York City,” says Fialkoff. In addition to helping train the future workforce for a burgeoning tech industry in NYC, Ladders for Leaders is a way to combat the youth employment crisis in the City. While New York has a graduation rate of 73%, only about one third of NYC youth are considered college and career ready, and according to the Office of the Mayor, 140,000 young people 16-24 in New York City are out of work and out of school. With 1.1 million public school students plus CUNY students that come from a variety of backgrounds and cultures, Fialkoff says New York has the demographics that can help address the lack of diversity in tech. One organization opening their door to Ladders for Leaders interns is Vizalytics Technology, a startup that provides localized analytics to enterprises, government organizations, and SMBs. The company has been hosting interns since 2013. At the helm of Vizalytics is CEO and New York-native, Aileen Gemma Smith. One of the reasons Smith got involved in the Ladders for Leaders program was to help create opportunities for NYC’s youth in the tech sector and to create teams that reflect New York’s diverse population. “I want students that wouldn’t otherwise have those opportunities. The young adult that has something to prove and no one has ever given them the chance. When you connect with those students, it creates a synergy and a way that can impact them far beyond one summer,” says Smith. One of those hard-working interns was Dao. She interned for Vizalytics during the summer of 2015 and spent her internship selecting data segments from city government open data sources that would benefit small business owners. “Seeing how much data was readily available was eye opening,” says Dao. “I learned how to think in the minds of others.” Dao plans to declare her major in statistics and data science in the fall of this year.